In TechTip #85, I discussed upgrading the rear incandescent light fixtures on our RV to L.E.D. ones. With that improvement completed successfully, I decided to continue to travel the improvement path by changing to L.E.D.s in other locations on the exterior of our coach. When asked at our ‘ABCs of L.E.D.s’ seminars about replacing bulbs in exterior RV lights, my mantra is ‘replace the fixture, not the bulb’. The reasons for doing this is that the exterior light fixtures were designed for specific incandescent light bulbs in order to meet the D.O.T. lighting standards. Simply replacing the bulb rarely provides the light intensity and broad coverage required due to the different design of the L.E.D. replacement bulb. Secondly, corrosion of electrical connections is a large concern when the reduced current draw of a L.E.D. bulb inserted into an electrical circuit that may be 80 to 90 feet (24m to 27m) in length. Since the L.E.D. draws about 10% of the power of the original bulb, it may not be able to overcome the resistance found in corroded electrical connections not only at the fixture but also in the circuit from the control switch or ground connections. A properly designed L.E.D. fixture which meets the D.O.T. standards overcomes the first issue; however, the second issue may still need to be dealt with even with a complete fixture exchange. Admittedly there may be situations where the fixture selections are limited or non-existent and a bulb exchange may be the only option. The front and rear side corner fixtures on our coach were already L.E.D. which left just three other lights to be converted. The first was the front signal which has a clear lens cover and an excellent ‘beaded’ reflector. Replacing the existing bulb with a bright L.E.D. that takes advantage of this reflector was a viable option. The original lens cover itself was ‘milky’ due to oxidation and deterioration from ozone. I had to replace these fixtures since the lens cover was not available separately. The result was a sharp, attention getting signal that provides equivalent light intensity and dispersion to the original bulb. < That left the coach side lighting as the remaining area to improve. Our coach had incandescent docking lights that fit into a rubber grommet. Each lens was very ‘milky’, having deteriorated over the years. Complete L.E.D. sealed replacement units were available since they are used as backup lights on over-the-road trucks and trailers. The L.E.D. replacements come with a new grommet which the fixture is pressed into, together with a new electrical connector. Exchanging these lighting units was simply a matter of prying out the existing fixture from the grommet, removing and replacing the grommet with the new one and plugging the new fixture into the existing matching wiring connector (which still had ample amounts of di-electric grease on the electrical connectors). The connected assembly was inserted into the new grommet to complete the exchange. Replacing four docking lights took less than one hour. The improvement in lighting was significant. These lights actually do provide sufficient light when parking at night. Even during the day, I have begun turning them on to provide a bright signal to passing traffic that the coach is parking or backing up. When we back our RV into the spot at our home, we back across lanes of traffic and the L.E.D. docking lights provide a far brighter indication to oncoming traffic that the coach is backing up. The only drawback we have found is that these docking lights are connected to the RV alarm system, and when the system is armed or disarmed a pulse is sent to these docking lights indicating that the system has reacted to the remote. The flash of light is so short that if you are not looking at the lights, you may not see the indication. We’ve learned to look at them when remote locking and all is well. We also have the alarm indication providing a short pulse tone as well. The remaining lights were four pairs of 6” (15cm) vertical fixtures that have a small #194 ‘peanut’ bulb at the top and a reflector over the majority of its length. In the original application on the vehicle for which these lights were designed, these would have been the front horizontal amber reflector and marker light and would have been fitted into the plastic bumper assembly. Their primary purpose would have been to provide a side mounted reflector with the requisite marker light. On our coach these are vertically mounted with one unit of each pair being a marker light and the other a side mounted signal light. These were barely acceptable as marker lights on such a large vehicle and were woefully inadequate as a side mounted signal. The bulb is very small and the flush mounting did not provide much signal projection to inform adjacent traffic that the signal was on. The vertical location on our coach open to the wheel well behind, also proved to be a poor one because water would get around the bulb socket, filling the reflector section and the lower half of bulb section with water. Over time dirt and algae built up, reducing the effectiveness of both the lamp and the reflector. The challenge was to find a suitable replacement since the mounting holes were over 1” (2.54cm) to allow clearance for the bulb and the fixtures were spaced about 2” (5cm) apart. In addition, there was a screw hole at the top and bottom that were about 6” (15cm) apart. It would become quite a challenge to find something that would physically fit as well as something that would be aesthetically appealing. The initial approach I took was to look for individual L.E.D. replacements for the existing fixtures, which would have to be large enough to cover the bulb hole and long enough to cover the screw holes. I located and ordered some, however when they arrived they were different than shown online with a slight curve to them. They were also held on with double sided tape. The curve meant that the lower screw holes would not be covered and they were slightly narrower than the drilled bulb hole which would have required them to be mounted on a metal base to cover the holes. The wiring came out at the top which meant it would be hard to hide when mounting. The last factor that caused them to be rejected was that the front four fixtures are mounted below the fuel fillers on either side of the coach. 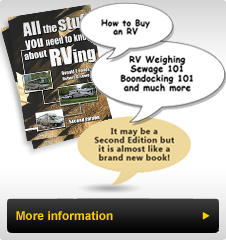 This RV has a propensity to ‘spit back’ fuel when filling since the top of the tank and filler are almost level. One needs to listen to the sound of the fuel filling and react immediately to the change in sound, otherwise some fuel will flow out the filler and run down the body side. An adhesive mounting would not survive the fuel spills. With these rejected I was wondering whether I could find a suitable replacement. Modern technology eventually came to my rescue. As a result of some other work I was involved in, I knew that the trend in vehicle lighting is to use one L.E.D. fixture as a multipurpose unit. Thus signal/brake lighting is simply the same set of L.E.D.s shining brighter than when used as the taillight/marker function of the same fixture. The L.E.D. docking lights came equipped with a three pin connector which plugged into the fixture. The existing wiring connector had just two pins yet it fitted the three pin socket on the docking light. I soon started looking for a single larger fixture with a combined marker and signal function. Since I already had the ‘grommet-style’ docking lights, I thought that pursuing that type of light might yield a workable solution. I was not looking forward to cutting a large hole in the fiberglass body however I had large holes to cover so this might not be an option. In my investigation I came across some surface mounted fixtures that mimicked the look of the ‘grommet-style’ ones and used a plastic chrome bezel to cover the mounting screws. Checking the dimensions, I learned that one fixture at each location would just cover the two large and the four screw holes. Before ordering, I double checked the dimensions again and confirmed my initial impression. I ordered them and when they arrived I learned that they did not have the expected plug-in three wire connector but three individual wires protruding from the rear of the fixture. That meant that a new hole would have to be drilled to allow the wiring to pass through the body. The units proved to be suitable in all other respected. I removed the existing fixtures, cleaned and waxed the body and applied aluminum tape to cover all of the existing holes, shaping it to match the oval shape of the new fixtures. At the front these L.E.D. fixtures were matched in height to the docking lights immediately adjacent. In the rear the docking light was located behind the wheel, while the pair of old fixtures were located ahead of the wheel, although both docking and lighting units were mounted in the wheel well area. Preparation was the same front and rear. After installing the fixtures using stainless steel screws, I waxed both the light unit and the chrome plated bezel and installed it on each fixture. Removing the existing wiring involved cutting wire ties that wrapped up extra wire from the chassis harness into which Fleetwood had connected their lighting harness. I was able to remove their purpose-built wiring harness, shorten it and connect the new fixtures to it, then plug the Fleetwood end back into the Chassis connector. Using good wiring techniques, applying heat shrink, reinstalling the loom covering and reattaching the new harness to the support structure gave a much neater installation. From the wheel well side, I caulked around the new wiring hole and filled the holes, that had been covered with aluminum tape on the exterior, with caulking. The new fixture uses the same L.E.D.s for both marker and signal light function, reducing the voltage when in the marker light mode and applying full voltage to give the signal its eye-catching brightness. The fixture sticks out about an inch (2.54cm) from the body and since the bezel does not completely cover the section immediately below the flat face, the L.E.D.s can be seen from beside and approaching the RV. Thus adjacent vehicles will be aware that the coach signal is on, when approaching or when beside it. The only area on our RV that does not have L.E.D. lighting is the marker lights on the front and rear caps. Given the location and the excellent sealing that keeps the moisture out, I am uncertain about whether I will replace them. We don’t travel all that much at night and other than acknowledging to a vehicle that has given us clearance to pull in, I don’t use these lights all that much. Hopefully from this article gives you further information about converting your RV exterior lighting to L.E.D.s.